A new article just came out. Roughly 1/3rd of college and high school students will experience acute anxiety each year. These numbers are way up. For anyone who has experienced anxiety or watched a loved one who has, you know it's debilitating. This isn't your garden variety nervousness. Personally, of all the potential that CBD holds, anxiety is one closest to my heart. I've seen it up front and close and the house nearly fell apart as a result. It's the reason we became evangelist for CBD. We've seen what it can do on this front. Check out Our CBD Story here. Anxiety is probably the biggest reason people eventually end up at CBD. I say end up, but there's usually a series of medications, remedies, other lifestyle "fixes" tried first. Here's the deal...telling someone to meditate when they're in the throws of anxiety or a panic attack is like fighting the tide! There are very powerful chemical and hormonal actors at work here. We need to at least balance the table before we set it! That's where CBD comes into play. You may have already read up on what anxiety is in the body. Let's go a little deeper without getting lost in the weeds. 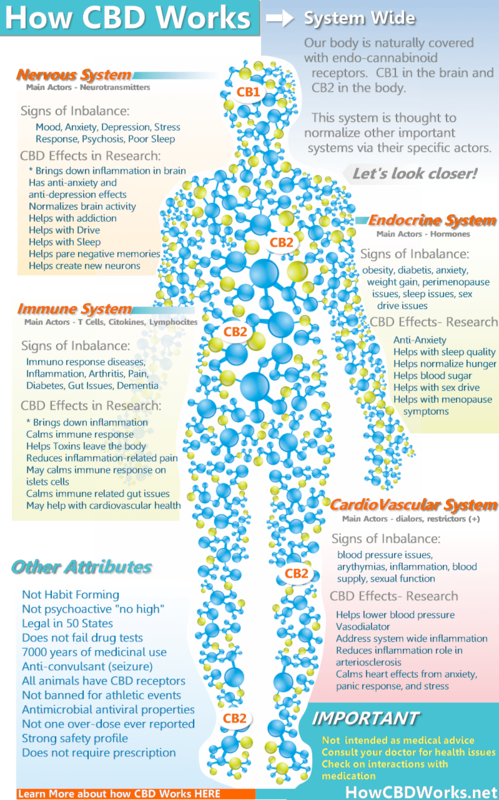 As we mentioned in How CBD works and the CBD Beginner's Guide, you have many separate but interacting systems in the body and brain. No wonder anxiety feels so overwhelming. You're talking about the two most powerful systems in the body/brain for dictating how we feel and how we perceive the world around us. Anxiousness is a natural state created in order to deal with potential danger. Anxiety, however, is when this state pops up without a danger or remains chronically or overly intense. We're going to talk about how CBD works in with all this, so let's introduce the main actors (culprits) in the anxiety dance. There are other intermediaries and bit roles but these four are critical for anxiety. Cortisol and Noraepinephine are your fight or flight chemicals. Left unchecked, they are the instigators of anxiety. Without cortisol, you wouldn't wake up in morning, ever be alert, or be able to focus on anything. We need cortisol. It needs to ebb and flow with the cycle of the day (sleep/wake for example). Noraepinephine is your surging chemical. Adrenaline rush! It's the bazooka in the anxiety arsenal. Use sparingly and for brief periods of time! Occasionally, it needs to make us jump out of the way of proverbial oncoming bus! The problem is when it becomes the bus! That's where GABA comes into play. GABA is the calming counterpunch to Cortisol and Noraepinephrine. The body works this way. Opposing forces that temporarily gain the upper hand when needed! Hormones are a little nuanced but equally powerful. Progesterone can also have a calming effect in the body. Estrogen can create a general sense of well-being. And testosterone?? Isn't that the "Agro" hormone? Yes and no. You need some of it. Some interesting research showed that testosterone conveys a general "removal" of worry from one's own actions! That kind of sounds like the opposite of anxiety! So...we need our hormones in balance (especially important for men and women beyond age 40). Anyone who has been through periminopause needs no further explanation of the power of out of balance hormones. The Dutch Test is awesome for people to find out where their levels are! Again, there's a lot we can do to help things but for some people, none of this works due to a chemical imbalance. My wife during perimopause did EVERYTHING imaginable but to no avail. It was finally balancing hormones, supplements, and CBD that helped. So...we talked about the main actors in the body associated with anxiety. In general, there's a balance with these chemicals as with every system in the body. This is probably the best studied issue with CBD. It's also the #1 reason people end up with anxiety. I say end up because they've usually tried a slew of other things first. We'll get into the studies of CBD and anxiety next, but what is actually happening? Millions of people are getting anxiety relief from CBD but how specifically? There are at least two potential pathways. Do two of those look familiar? The working theory is that the endocannabinoid system is totally over-worked in today's modern world. The endocrine system alone is under constant assault from chemicals that didn't exist just 50 years ago. They're now in our blood stream and even in the womb. It's estimated that 40% of the population has the MTHFR gene. This means you don't utilize vitamin B12 well. Just a head's up...the protective nerve sheaths are made from B12! Get a methylated B Complex vitamin STAT! The endocannabinoid system has the impossible job of keeping both of these systems in balance. With a constant onslaught from within and without! That's where CBD comes into play! 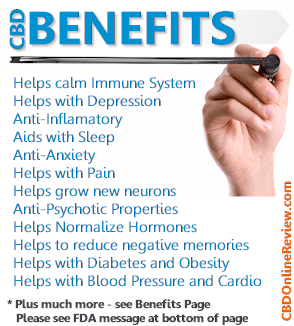 CBD (a cannabinoid occurring naturally in hemp) interacts with our own natural system to make it work better. 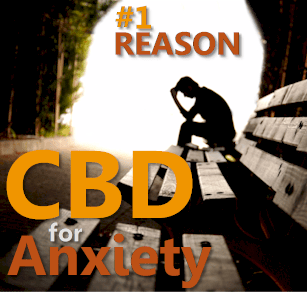 Don't take our word for it....let's look at CBD and anxiety research. There's actually quite a bit of research into CBD for anxiety. It's such a source of suffering and the alternatives have pretty nasty downsides. There's some tie in with 5HTP (you'll see this sold in stores for anxiety). Most of the studies demonstrated a good interaction between CBD and the 5-HT1A neuro-receptor. What about Generalized Social Anxiety Disorder (prolonged anxiety) with a stress inducer we all love...public speaking! Pretreatment with CBD significantly reduced anxiety, cognitive impairment and discomfort in their speech performance, and significantly decreased alert in their anticipatory speech. That's awesome! They also measured heart rate, blood pressure, skin conductance...things that are to "placebo". I hate public speaking...good to know. Now, we're seeing the people are feeling less anxiety but brain scans are also confirming that pattern in brain flow. 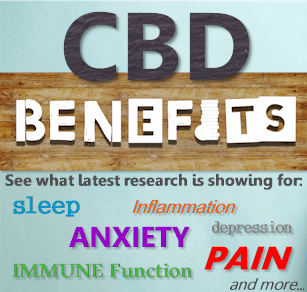 These results suggest that CBD has anxiolytic properties, and that these effects are mediated by an action on limbic and paralimbic brain areas. A further hint here...Anandamide (a naturally occuring endocannabinoid) may be central to how CBD helps. These results give further support to the proposal that BNST is involved in the anxiolytic-like effects of CBD observed after systemic administration, probably by facilitating local 5-HT1A receptor-mediated neurotransmission. Even more interesting, CBD has shown progress in neurogenesis (creating new pathways and neurons). This is huge for PTSD and other anxiety related disorders where existing pathways need to be "re-written" or bypassed. These findings support that the anxiolytic effect of chronic CBD administration in stressed mice depends on its proneurogenic action in the adult hippocampus by facilitating endocannabinoid-mediated signalling. The endocannabinoid system appears to be integral to this process of new learning for our nervous system. Along these lines, reducing anxiety can also mean "forgetting" triggers or past trauma that initiate an anxiety response. it reduces learned fear in paradigms that are translationally relevant to phobias and post-traumatic stress disorder. Forgetting bad memories to make room for new neuronal growth. Nice! Anxiety is a leading disruptor of sleep! There's a lot of interest in this. 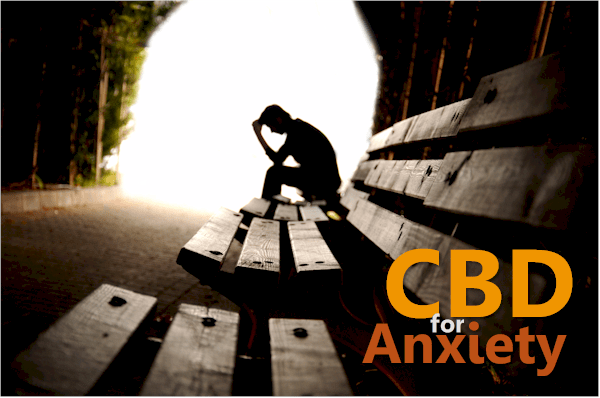 Finally, an exhaustive look at the benefits of CBD for anxiety here. Why? We already have lots of anti-anxiety medications. When my wife started having panic attacks as a result of perimenopause, the doctors THREW medications at her. She eventually stopped the final medication Lexipro after 3 days of not sleeping and ending up in the ER. It was the worst time of our lives bar NONE. The side effects on these meds can be terrible. You'll even see anxiety and depression (not to mention suicidal thoughts) on the list! Clearly, we're not as smart as we think we are with medications. The main issue is that many of these meds can be addictive and are not designed for long term use. Xanax is about to be the new opioid crisis! It's hiding in plain site at the high schools now. That doctors even prescribe these meds without first looking at CBD is either ignorance, complacency, or something worse. The safety profile for CBD is remarkably strong. Most importantly, it addresses anxiety systemically. No whack-a-mole approach that rips other nutrients out of your body or send some other system off-balance. It's definitely the first step in our opinion. How safe is it? Are there side effects for CBD with anxiety? If you're suffering from anxiety, none of these sounds like bad things. Everyone's chemistry is different so test the dosage first and work your way up. You can read all about the safety of CBD here. The tincture is most popular for long term use. It generally takes 20-30 minutes to kick in but it lasts longer. We have feedback from many people that the vape is extremely useful for a panic attack or sudden onset of anxiety. It works the fastest since it doesn't have to be metabolized. Your edibles are more for micro-dosing or to create a general level of effect over time. It can also work right before a very stressful situation. Personally, I use CBD edibles right before basketball. That's just me but those are the three best options for anxiety. We recommend a clean CBD isolate to start. Try the Isolate first and then evaluate the full spectrum for your system. Make sure to let us know how you like the result for a given product here. 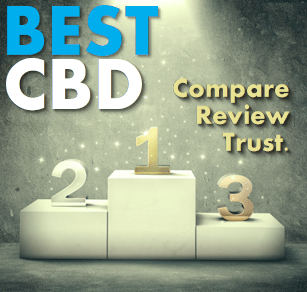 Most of the reviews for CBD are very positive when it comes to anxiety. The great thing about anxiety is that you'll know right away if it works. There's no guessing with anxiety! Please let us know what brand, type of CBD (tincture, vape, edible, etc), and dosage you tried with what results. The guidance is to start low and build up. There is evidence that CBD is cumulative in effect. It depends on how intense your anxiety is! The standard therapeutic dose is 25mg. We've seen a study up to 1500mg in a day but that's extreme. The higher doses tried in research for more severe issues are 300mg and 600mg daily. Maybe try 15mg and work up to 25mg a day. From there, gauge where you're at in terms of anxiety levels and general reception. There is no known documented case of overdose on CBD but go slow! 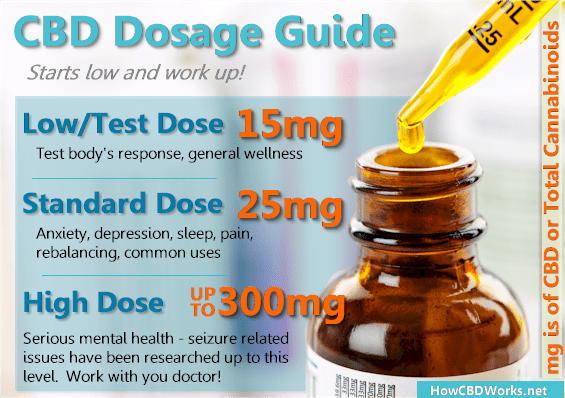 Learn all about CBD dosages here. The type of CBD delivery can have a big impact. There are two theories here and I've seen both play out personally. The tincture of CBD is generally the chosen approach. It's very controllable in terms of dosage. If sub-lingual, it can absorp pretty quickly (20-30 minutes on average). This works well for an ongoing regiment. We've never been partial to the vape option but our minds have changed there. For very acute panic attacks or anxiety where you need immediate relief, the CBD vape is pretty miraculous. In fact, it's amazing that you're just using a plant based substance with no psychoactive properties! The immediate "shoulder releasing" effect is impressive. You can shop for both of these here below. We screened the big CBD companies in our CBD brand comparison. For anxiety, we recommend tincture or vape depending on how quickly you need relief. For brand, all the companies are screened. We would focus on the best value category from the product page since we need to be able to afford this! Make sure to learn how CBD works. CBD is a game changer for anxiety. A game many people have been suffering through for too long.